CCO earrings are crafted in solid anti-tarnish sterling* silver with sterling silver hooks. The drops are hand polished. *Sterling silver is defined as having at least 92.5% pure silver content. The LeachGarner LG422 Argentium sterling used in these earrings contains 92.7% silver and, in addition to being tarnish resistant, is harder than traditional sterling due to differences in the remaining alloy content. Shipping is free regardless of North America destination. 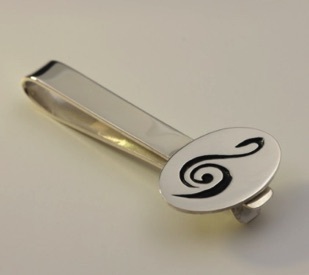 CCO tie bars are crafted in solid sterling silver with black enamel CCO logo inlay.